Corby Town fought back from a goal down to earn a 1-1 draw at 10-man Carlton Town in the Evo-Stik League South. The hosts had the better of things in the first half and took the lead on eight minutes thanks to a deflected effort from Kaylum Mitchell. 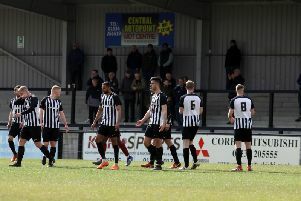 Ben Hutchinson hit the post for Carlton but Corby’s hopes were boosted when the home side were reduced to 10 men after Aaron Hooton was sent-off just before the half-hour. And the Steelmen took advantage after the break as they had an effort cleared off the line before Jake Bettles brought them level on 69 minutes. There were no further goals as Corby can now look forward to back-to-back home matches as they take on Chasetown on Saturday before welcoming Stamford to Steel Park for a local derby next Wednesday night.